Antarctica's Lake Bonney is an inaccessible place locked under 15 ft. of ice. But scientists may soon explore it, thanks to a 6.5-ft., 3,000-lb. 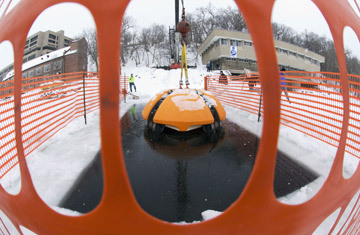 NASA-funded robot sub just tested in Wisconsin's Lake Mendota. The sub performed so well, it could be diving in Lake Bonney by year's end. It may also serve as a prototype for a mission to the icy oceans on Jupiter's moon Europa.